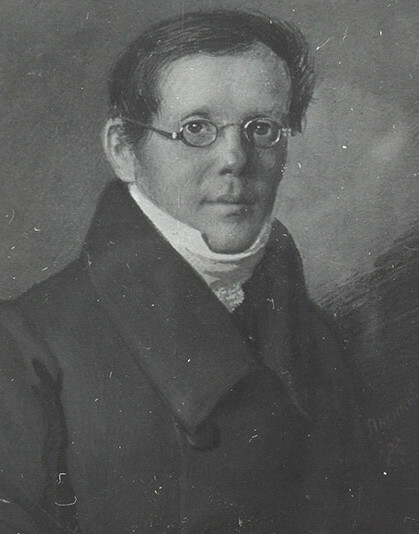 In 1817 the Russian Semyon Nikolaevich Korsakov (see biography of Semyon Korsakov) accepted a position in the statistics department of the Police Ministry in St. Peterburg. Inspired from his daily work, soon he was intrigued with the possibility of using machinery to enhance natural intelligence and began construction of several devices which he called machines for the comparison of ideas. 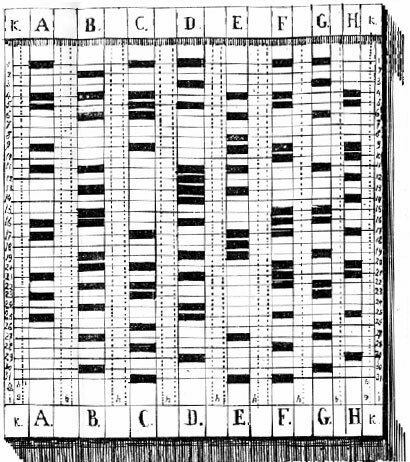 The purpose of these logical devices was primarily to facilitate the search for information (for homeopathic medicines and treatment), stored in the form of punched cards or similar media (e.g. wooden boards with holes). 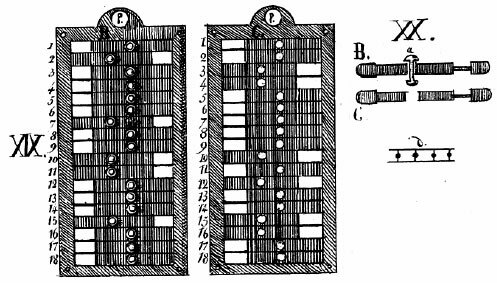 Just like Charles Babbage, Korsakov could see the perspective of the suggested mechanization of thinking, and just like Babbage, he intended to use punched cards as a memory holder. 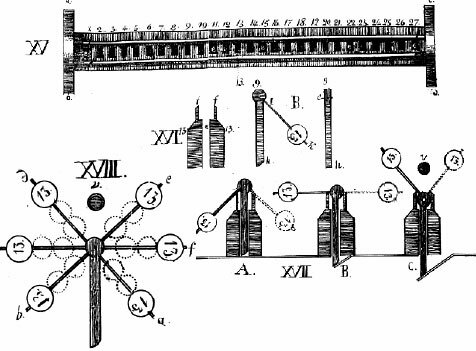 Korsakov announced his new devices in September 1832, in a brochure in French, entitled Apercu d`un procede nouveau d`investigation au moyen de machines a comparer les idees (Description of a new way for research, using machines for comparing ideas). Later the same year, he presented his ideas to the Imperial Academy of Sciences in St. Petersburg, but their experts rejected his application, failing to see the potential of mechanizing searches through large stores of information. The commission, lead by the famous mathematician M. Ostrogradskyi, even made an ironical note: "Mr. Korsakov wasted too much intelligence, in order to teach other people to live without intelligence. 1. Linear homeoscope with unmovable parts. 2. Linear homeoscope with movable parts. On the nearby image is presented the Linear Homeoscope with unmovable parts (left-perspective view, right-side view). On the lower image is presented the Homeoscope table. How works the Linear Homeoscope? In the Homeoscope table can be set a number of "ideas", as each column can represent one "idea" as a group of holes. The Homeoscope is a wooden lath, which height is equal to the height of the table, and it works as a "selector" of ideas. Using pins, which can be pressed down to stick out of the lower surface, we can set a pattern (search criteria) for the selector. Then, when we are moving the Homeoscope across the table we are actually searching for matching data (each pin of the Homeoscope corresponds to one row of the table), as the Homeoscope will fall down and stop its movement when (and if) it finds a column (idea), which has holes in the same rows, where the pins are pressed down. If the ideas, signed as columns A, B, C, D, etc, in the table, are indicating the areas of using of different medicines, and rows are indicating different symptoms of diseases, which will be cured by these medicines, then we can set in the Homeoscope all the symptoms of a particular disease, and to move it across the table until will be stopped (a match will be found). Thus we can see which exactly medicine is suitable to be used for these particular symptoms. The Linear Homeoscope with movable parts (see the drawing below) is an improved version of the Linear Homeoscope with unmovable parts. 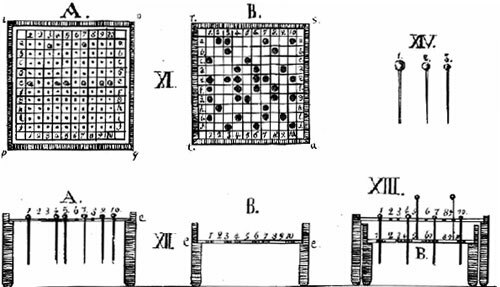 The tables are the same, but the Homeoscope has moveable parts, which made possible more complicated search criteria and algorithms to be used. The Flat Homeoscope (see the image below) used 2 tables and compared the template (search criteria) from the upper table to the dataset (ideas) of the lower table. The upper table (marked with A) has holes in all the cells, which can contain pins. The lower table is the same size, but has holes only in some cells, according to the idea (search criteria). In the upper table can be set all the symptoms of a particular disease, while in the lower table can be set all cases, which will benefit of using a particular medicine. Thus we can prepare a table for all medicines, and to use them one after another, until we find a match—a proper medicine for the particular disease. 1. To find all matches between 2 compared ideas. 2. To find all items, presented in the source-idea, but are missing in the target idea. 3. To find all items, missing in the source-idea, but are presented in the target idea. 4. To find all items, missing in both ideas, but are presented in other ideas in the same table. The Ideoscope (see the image below) is capable also to find during the comparison the relative importance of every detail. The number of compared ideas can reach several hundred, and every idea can contain more then a hundred details. 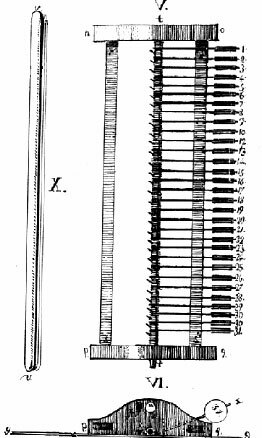 Besides that, the Ideoscope (just like Homeoscopes, described above), can be upgraded in order to work with cylindrical tables. 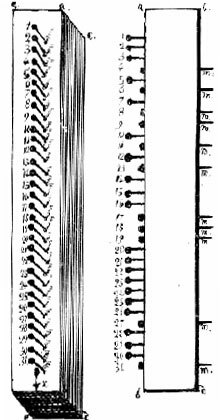 The Simple Comparator of Korsakov (see the drawing below) can produce the same 4 results, as the Ideoscope, but it is capable to work with 2 ideas, comparing them in between. It can contain only several tens of details, but is excels the Ideoscope at that, because it doesn't need a table to be prepared.